It’s a bucket list destination for many, with the power to reshape your perspective and make lifelong adventure travel dreams come true. What makes the Arctic so spectacular? In this comprehensive post, we’ll explore the regions that make up the Arctic and the exciting, fulfilling things you can see, do and experience there. We’ll check out the highlights of this vast northern polar region, and see how you can experience the Arctic with Quark. Along the way, you’ll have access to additional resources to help you plan your ideal Arctic expedition. 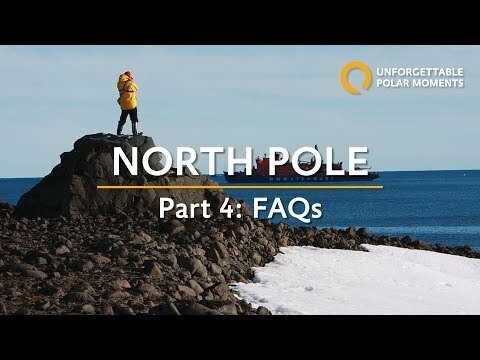 Keep reading, or click on one of the section headings in this list to navigate directly to the piece that answers your questions about Arctic expedition travel. 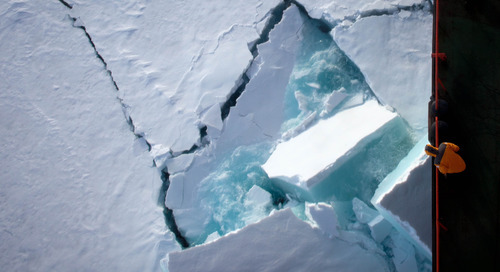 How is the Arctic different from Antarctica? Where should I go in the Arctic? 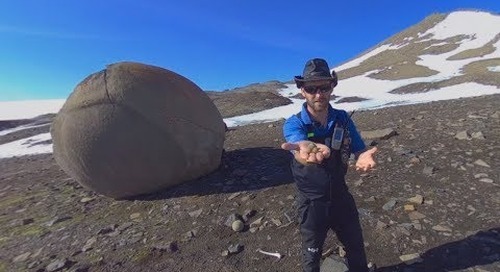 What can I see in the Arctic? What can I do in the Arctic? When should I go to the Arctic? Why choose a small expedition ship for your Arctic adventure? 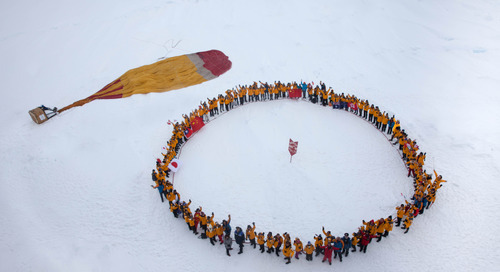 A polar expedition is a great, big deal, and people go for all kinds of reasons. Maybe you’ve heard that the polar regions are must-visit, bucket list places to explore at some point in your life. In that case, read Polar Travel is Good for the Soul and 5 Reasons an Arctic Expedition Is Totally Worth Your Vacation Time to see why people travel to the ends of the earth, often returning again and again. 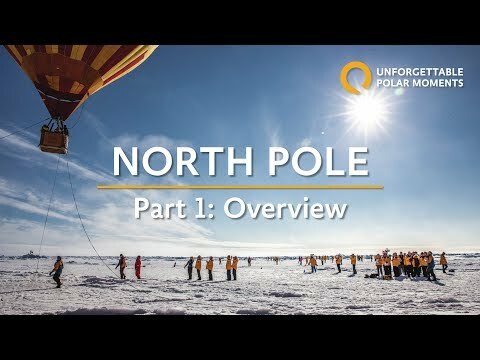 Some of the people interested in Arctic travel already have an idea of what they want to see or do there--they want to do a polar plunge, or see polar bears in their natural habitat, or cruise amongst icebergs under towering fjords--and they just aren’t sure where to go or how to make it happen. Home to unique species like polar bears, muskox and endemic foxes and hares, the Arctic is a popular destination for wildlife lovers and photographers. Others may be just discovering the Arctic and starting to think that it could be a place they’d like to visit. In that case, you can get a taste of the things you can see and do there in Top 10 Reasons to Visit the Arctic. Check out the Top 5 Landing Sites to get an idea of the places you might get to explore on foot, and read on to learn more about what you can see and do, and where to go to make it happen! Some people who want to visit the Arctic have already traveled to Antarctica and are curious about how the northern polar region differs. 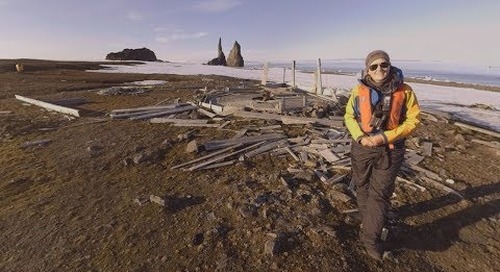 One of the main differences is the Arctic’s fascinating history and culture, as it’s been inhabited for thousands of years. Culture & People of the Far North, Top Shipwrecks of the Arctic and Franklin’s Expedition: Myths, Mystery & Modern Day Relics are all great reads to help you get familiar with the opportunities to explore the Arctic’s history and culture on expedition. Read What Makes Up the Arctic? to keep exploring. Often, our travelers have heard or read a lot about a specific Arctic destination and know that’s where they want to go, but they aren’t quite sure what that’s going to look like in reality. If you already have your heart set on visiting Greenland, Spitsbergen, or the Canadian High Arctic, keep reading to see what makes each Arctic destination so magical. Unlike the single land mass that is Antarctica, the Arctic is mostly made up of water, with islands and land masses belonging to several countries. The Arctic accounts for about one-sixth of the planet’s area and to give you an idea of just how empty and vast this is, consider that the entire Arctic is home to just four million people--its population is about the same as that of Los Angeles! 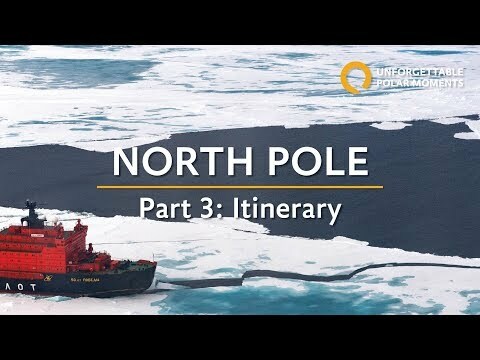 You can learn more in Where is the Arctic and how can I get there. If you’re looking for opportunities to see and photograph a variety of Arctic animals in beautiful, natural surroundings, you should consider traveling to Spitsbergen, a territory of Norway known as the “realm of the polar bear”. If you’re looking for a diverse range of Arctic experiences from Inuit culture and exploration history, to Arctic wildlife and incredibly spectacular remote landscapes, Baffin Island, Canada, is the place for you. 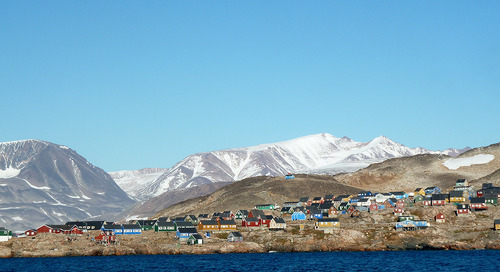 Baffin Island is a massive island spanning much of Eastern Canada, with many small communities, wildlife sanctuaries, and national and territorial parks. 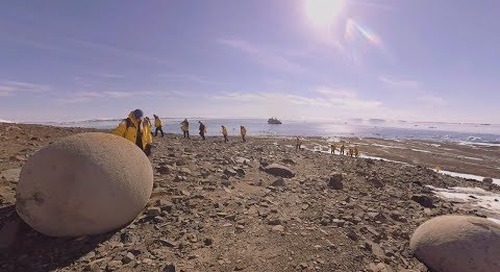 It’s the iconic exploration dream come true, to stand at the one place on the planet where a look in any direction is a look south. Celebrate with a champagne toast at the North Pole and then walk on the ice, or even take in the scene from high above in a hot air balloon. 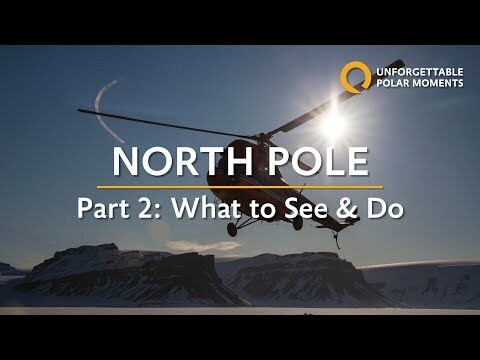 Read more about what it takes to get to the North Pole (hint: you’ll need an icebreaker, and we take you there onboard the most powerful nuclear one on earth). Then check out this video to see for yourself! Whether you're a naturalist, an avid wildlife photographer, a hiker in search of stunning scenery or just want to check "see a polar bear in it’s natural habitat" off your bucket list, the Arctic can deliver. Spitsbergen offers your best chance to spot polar bear and is also home to walrus, whales, seabird colonies, reindeer and arctic fox. Greenland is where you might see muskoxen, and possibly whales and seals. 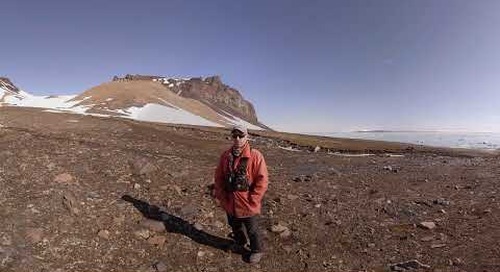 Baffin Island is home to walrus, whales, muskoxen, lemmings, wolves and other unique species. Arctic Watch is a world class beluga whale observation site, and you might also spot arctic fox, arctic hare, muskox, ringed seal, caribou, snowy owls, peregrine falcons and maybe--just maybe--a polar bear walking the nearby migratory route. And en route to the North Pole, you might catch a glimpse of a polar bear hunting on the sea ice, or whales breaching in open water. Explore our Arctic Cheat Sheet to discover destinations. If you’re looking to encounter wildlife and follow in the footsteps of famous explorers, or experience Inuit culture in one of the world’s last pristine wilderness areas, the Arctic is just the ticket. 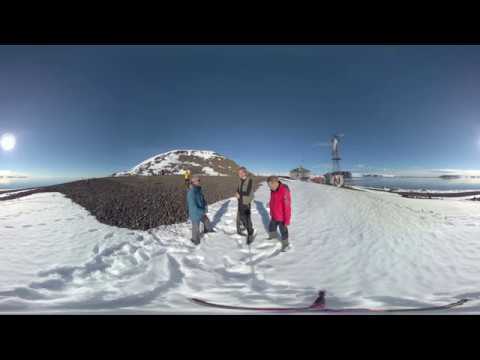 So what can you do while on expedition? Go Zodiac cruising and hiking. Take in expert lectures from onboard marine biologists, geologists, ornithologists, historians and other guests and guides. Spot wildlife and take photos from the deck and the open bridge, where you can also observe how the Captain and officers sail and navigate the ship. Take part in classes, special events and activities offered onboard. Trade travel stories in the lounge, relax and enjoy creature comforts and panoramic views, stretch your legs in the gym or feed your thirst for polar knowledge in the Polar Library. Push your limits with incredible rites of passage like the Polar Plunge. Take part in the Polar Plunge… if you dare! 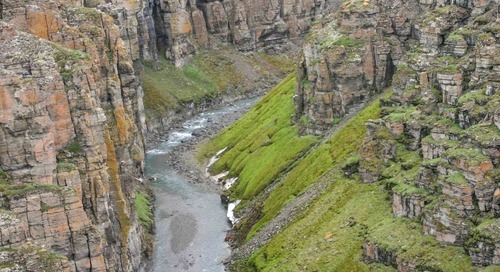 Hike the tundra, exploring colourful valleys and powering your way up rocky inclines to enjoy stunning vistas. Visit incredible bird cliffs, explore infrequently visited and remote landing sites, and leave the stress of your everyday life behind. 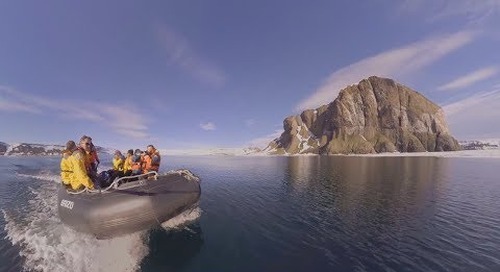 Search for wildlife from your expedition’s ship, out in the Zodiac cruisers, and inside Greenland’s parks and wilderness areas. Visit historic sites and immerse yourself in Thule and Viking history. Meet Inuit people in authentic Greenlandic villages; peruse their art, hear their songs and get to know their way of life. Venture into natural polar bear habitat and capture incredible photos of Arctic wildlife. There’s even a photography-focused expedition coming up in 2018. Exercise your polar passion by getting involved and taking action with environmental sustainability activities like Clean Up Svalbard. Explore by snowshoe on the paths less traveled for a whole new outlook at the spectacular Spitsbergen countryside. Go Zodiac cruising with expert guides in small groups for exciting encounters with nature, fantastic photo opportunities and a completely immersive environmental education. Experience Inuit culture and hospitality in small towns and villages like Kimmirut, Pangnirtung, and Pond Inlet. In these communities, artisans carry on the centuries-old tradition of crafting incredible jewelry and sculpture from serpentine, soapstone, marble and semi-precious gems. Visit breathtaking landing sites and explore the island’s diverse coastal areas by Zodiac cruise. 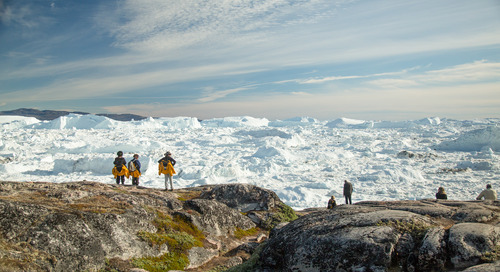 Explore rugged shorelines and striking tundra on foot ashore in the Cumberland Peninsula and Frobisher Bay. If you’re lucky, you may see caribou, lemmings or arctic hare. Go ATVing 500 miles north of the Arctic Circle to explore canyons, waterfalls, wildlife habitats, tundra, and icy inlets. Watch thousands of beluga whales parade and play in the Cunningham Inlet. 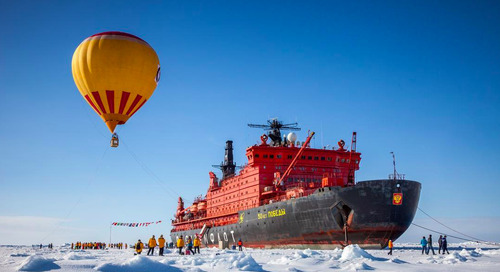 Experience life onboard the world’s most powerful nuclear icebreaker. Watch from the deck or bridge as you crush your way through thick, multi-year sea ice in true exploration style. Soar high overhead in a hot air balloon for a truly once in a lifetime experience and view (optional and weather permitting). Celebrate your travel achievement with music, merriment, great company and a unique celebration at the top of the world! Engage and learn from onboard experts at mealtimes, during shore landings, in their lectures and presentations, and as you spend time together onboard. Learn more about what you can do in the Arctic and how to take your adventure to the next level in your free copy of our Adventure Options guide. Darkness improves the visibility of the Northern Lights later in the year, so if that’s important to you, head to Greenland in September or October. Conditions are darker and cooler nearer the end of the season. Learn all about Greenland, how and when to explore, what activities to choose and how to maximize your adventure in this short guide. Visit Baffin Island in late August and September, when conditions are best for photography, wildlife viewing, Zodiac cruising and hiking. The further north we go, the longer it stays light out and typically, there are only a few hours of twilight each evening, with no actual darkness. Learn all about Baffin Island, how and when to explore, what activities to choose and how to make the most of your adventure in this short guide. If you want to see polar bears, go to Spitsbergen in June or July. There more ice earlier in the year, and more polar bears are typically out hunting. If you’re hoping to have a shot at circumnavigating the island, there’s more chance of achieving it later in the season, when the pack ice has had a chance to break up and recede. Learn all about Spitsbergen, how and when to explore, what activities to choose and more in this brief guide. Explore the land of the midnight sun at Arctic Watch Wilderness Lodge. The very end of June to mid-August are the perfect time to visit Arctic Watch, as the midnight sun offers excellent conditions for photography, adventures and wildlife viewing. Read all about the exciting adventure options at Arctic Watch and how this is our most active expedition in this Arctic Watch Adventure Guide. There’s a relatively brief window in July and early August each year when ice conditions allow for passage to the North Pole. This makes your achievement that much more memorable! 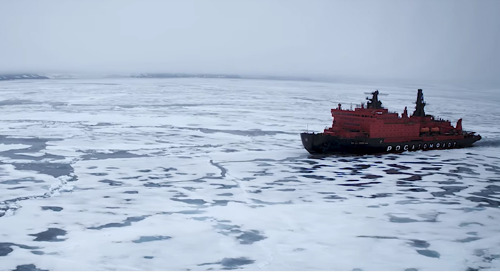 Learn more about crushing your way to the North Pole aboard 50 Years of Victory, the most powerful nuclear icebreaker in the world, in this brief guide. access to smaller communities, more remote beaches, narrower fjords and channels, and more. Your ship is your home base for the duration of your trip and while each vessel has its own character, you’ll be comfortable and well taken care of whether you’re cruising the Northwest Passage or exploring Spitsbergen. Ocean Adventurer is heading into the 2017 Arctic season fresh from a multi-million dollar renovation, giving it a more contemporary interior, brand new bathrooms and soft furnishings, and major technical improvements you can read about here. Ocean Nova is intimate and modern, carrying just 78 passengers in twin, triple and quad cabins. Like Ocean Adventurer, it’s equipped for Zodiac cruising, snowshoeing and hiking, and optional kayaking. 50 Years of Victory offers a couple of really unique and exciting features, including an onboard helicopter for sightseeing and scoping out ice. 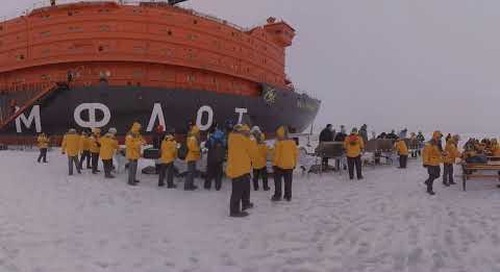 Watch the video below to see what life is like onboard the world’s most powerful nuclear icebreaker, and download the 50 Years of Victory Ship Book to learn more. Amanda is Director of Marketing at Quark Expeditions, a recent MBA grad, and a practitioner of positive psychology. In addition to her passion for travel, Amanda brings to Quark her belief that travel helps people push their growth boundaries, both literally and figuratively, and is always looking to connect with like-minded individuals. Connect with Amanda on LinkedIn here. 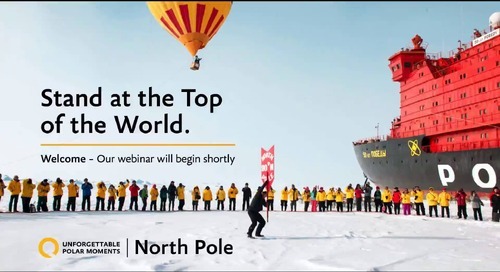 Visit the North Pole for the ultimate travel achievement: to stand at the top of the world, at 90 degrees North. Discover unique arctic wildlife, explore fascinating history and experience the thrill.